Also known as a cap. When your tooth is compromised to a level where a filling isn’t going to cut it we turn to this awesome workhorse. It is very natural looking, extremely sturdy, and will protect a tooth much longer than a filling. 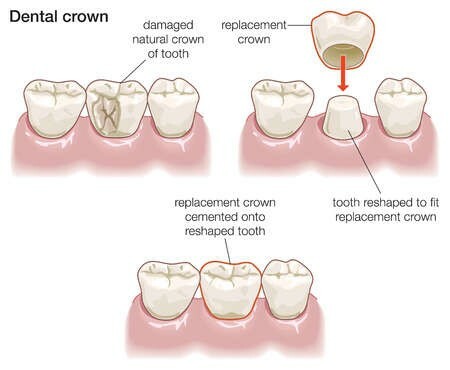 Common indications for a crown include fractured teeth (it hugs the tooth together rather than wedging it apart like a filling), large cavities, root canals, and for esthetics. Our crown materials are VERY SAFE. They are made of ceramic and zirconia, and will not react with your body like a metal crown might. We’ve moved away from PFM or metal crowns with porcelain because the technology and materials are just so much better these days. There’s absolutely no reason to have a crown with metal anymore. The crown is a 2 part procedure. At your first visit we trim the tooth to a smaller version of itself, then scan a DIGITAL impression which is sent to the artisans at our local, made in the USA, dental lab. You have a temporary crown on for a week or two, then we do a fitting. If we love the fit and it’s perfect then the crown is glued on, if we can do anything to make it even better we do that. Some offices will make crowns in an hour, which saves you a bit of time, but we’ve looked closely at these systems and quite frankly aren’t impressed with the quality of the product. An artist spending a week on your crown will probably do a nicer job than an assistant with 20 minutes to spare. We stand by our crowns! If you manage to break yours don’t worry, we’ll cover it. For life. That’s a pretty big insurance policy!